Scooper - Technology News: Is migration a threat or an opportunity for Europe? Austria has unilaterally declared a quota for asylum seekers. Greece is struggling to cope with a backlog of refugees that are no longer allowed to cross into Macedonia. Temporary controls are in place between Denmark and Sweden and at various other borders of the usually passport-free Schengen area. The EU deal to redistribute 160,000 asylum seekers internally has hardly begun. Meanwhile, Germany’s chancellor, Angela Merkel, is relentlessly pursuing a ‘European solution’ to the refugee crisis. She must deliver fast, before rising anxieties among German voters derail three regional elections on 13 March. All eyes are now on the EU refugee summit scheduled for early March. The outcome of this gathering, however, will crucially depend on Turkey’s willingness and ability to curtail the flood of refugees towards Europe. Behind this rapidly deteriorating situation stands the broader question: What does the refugee crisis mean for the future of the EU? This is one of the issue that the Global Agenda Council on Europe addresses in a new report . Around 1 million applications for asylum were lodged in the 28 EU countries in 2015, following around 600,000 for 2014, according to official EU statistics. Although those numbers appear daunting, total first-time asylum applicants in the last five years amount to roughly 0.4% of the EU population. This modest average hides stark differences between EU countries. Around one million refugees, asylum-seekers and migrants arrived in Germany alone in 2015 (not all of them stayed and even fewer applied for asylum, so statistics can be tricky to reconcile). In relation to its existing populations, Sweden has received the most refugees. The underlying reasons for refugee and migration flows are unlikely to disappear: the atrocious war in Syria, the fragile situation in Iraq and Afghanistan and the bulging populations of poor and badly run African states. 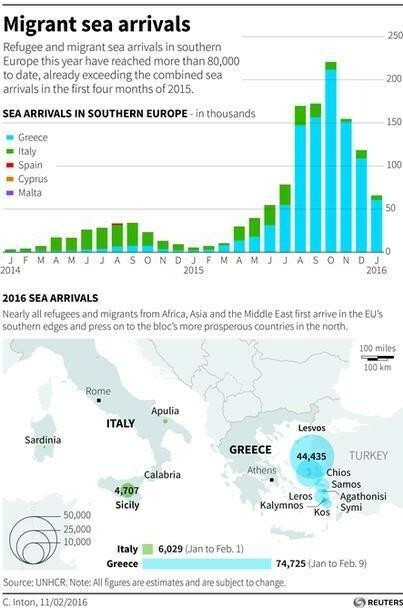 On the other hand, the various measures that EU governments are now putting into place – from declaring ‘safe’ the Western Balkan and North African states to ramping up returns of those who have no valid reason to stay – should have some impact on the numbers coming to Europe. Europeans must not see refugees and migrants purely as a threat to national politics or EU internal unity. It could be a great opportunity for an ageing continent. By 2030, the EU countries will have 16 million fewer people of working age (even with steady net migration). This would put great strains on social welfare systems and public finances. Migration can be an opportunity only if the new arrivals can swiftly and successfully integrate into labour markets and local communities. Past data for Germany indicate that in the first year after arrival, only 8% of refugees of working age found a job. After five years, this share went up to 50%. Governments, together with the private sector, will have to redouble their efforts to increase these numbers. The process of verifying and approving the qualifications of immigrants can, at present, take years. It must get much faster. But since only a limited number of the latest arrivals appear to have transferable qualifications, the biggest challenge will be language training, professional education and helping to match existing skills to local business demands. If integration policies improve, Europe could enter a virtuous circle. If more migrants find jobs, they will require less public support and instead start paying taxes and social security contributions. 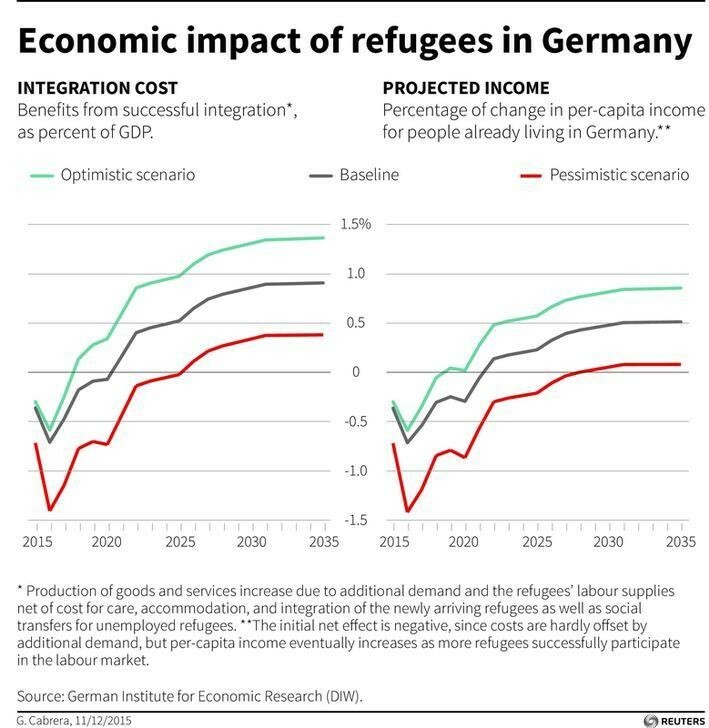 If migrants see opportunities for getting ahead, they will be keener to integrate. Such developments would deflate support for nationalist and xenophobic politicians. Europe will only enter this virtuous circle if it redirects its migration debate from burdens to opportunities. If it fails, the political consequences will be painful and profound. Many Europeans will continue to welcome and support the refugees. In many places, however, the influx will also play into the hands of populist parties and right-wing movements. Between 60 and 80% of people in France, Spain, the UK and Italy told pollsters in 2015 that they were unhappy about the immigration policies of their governments. In some regions in Germany, the anti-immigration AfD party now surpasses the mainstream Social Democrats in the polls. In France the refugee crisis might help to propel Marine Le Pen into the run-off of the 2017 presidential election. In the UK, migration could be the decisive factor in the in-out referendum scheduled for 23 June. In some other EU countries, incumbent governments will adopt a tougher stance on migration to re-capture voters that are drifting towards populist challengers. Such domestic political pressures, in turn, will make it harder for governments to find workable compromises at the EU level – without which the EU would fragment further. Europe still has a chance of turning the migration crisis into an economic and political opportunity. But the window is closing fast. The views expressed here reflect the discussions of the Global Agenda Council on Europe .